Rolling down the Ribbon in the RoadRunner, ready to requisition a root beer and repast, I ruminated upon my responsibility to include a post on those perennial purveyors of the modern sarsaparilla on Peoria, Weber's Superior Root Beer. So after a couple of cold frosty mugs, I returned to my current abode and began to research a bit. Well, where better to start than with the 'Weber' family themselves? The following is from their own site , and gives a pretty good history. Weber's Superior Root Beer was the creation of Oscar "Weber" Bilby back in the late 1800's. Oscar and his wife Fanny moved to Oklahoma from Missouri to a 640 acre farm just north of Sapulpa to an area now know as Bowden, Oklahoma in 1884. Oscar was a farmer, but he enjoyed experimenting with different soft drink condiments. Through trial and error, he put together a secret recipe consisting of 14 natural ingredients which were "fire brewed" then stored and aged in birch bark barrels. His famous Weber's Superior Root beer was then served at the peak of the flavoring cycle. Oscar used yeast to carbonate his root beer. While visiting the original Weber's, please try an order of our famous homemade onion rings or our tasty fresh French fries. Our delicious hamburgers are still made from 100% fresh ground angus beef. The original Weber's is also home of Tulsa's best sausage cheeseburgers. If you like chili, we invite you to try our wonderful chili cheeseburger, or a tasty double cheeseburger. 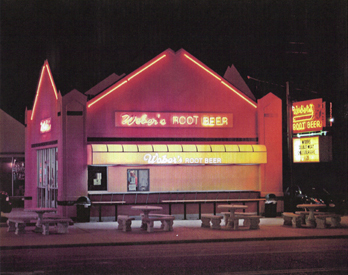 Weber's also still makes delicious root beer floats served in ice-cold frosted mugs. Try one! Even though it's now located at the 'wrong end' of the parking lot , Weber's still serves those great frosty mugs, floats, burgers and fries. I've been going there since shortly after I was born ; my parents loved their floats and we would go there with great regularity when I was a child and they would share. As soon as I could hold my own frosty 'baby bear' mug up myself, I had 'em leave out the ice cream and never looked back. Interestingly, with Weber's being the longest continuing running business in Brookside and being such a large part of the area's 'culture' , photos of the original building are hard to find online. If you, dear reader, have any photos or memories of Weber's, please share them here. And go have a frosty one next time you're in the area - tell 'em YrHmblHst sent ya. They'll probably look at you strange, but I imagine they'll serve you anyway! Haven't been to Webers in years, must try it again ; I'm a Sprecher man myself. Indeed, Sprecher's is my favourite too - IN A BOTTLE. [followed by Bundaberg from Australia] BUT, Webers ON TAP cant be beat! Go see what I mean!